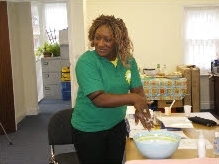 Our friendly and supportive team are directed by a ‘hands on’ manager, who is a qualified Social Worker with 35 years experience within the social services/private and voluntary sector in Consulting and Management positions, and who has also worked within the employment business for the past 15 years. Our Support/Care workers are led by an experienced Care Co-ordinator (qualified nurse) who works alongside experienced staff, and a healthy mix of ‘new’ workers, ensuring knowledge transfer is shared from existing and new staff, helping us move forward with ideas, preventing us becoming stagnant. Group supervision/s where best practices are discussed enabling ‘whole team’ to standardise. All our support/care workers are experienced and trained to QCF2/NVQ2 and QCF3/NVQ3, ongoing training, support and mentoring is key to the development of our staff, our overall services to the clients, and our business. Our staff have a wide range of knowledge, skills and experience, enhanced with their life skills from varied cultural backgrounds.